Phantoms captain James Ferrara has revealed the line-up for another of the teams taking part in his May 5 testimonial. The Panthers side bears the name of the Nottingham club he represented in the Elite League and is captained by Peterborough-born great David Clarke. Assistant captains are Steve Lee and Robert Lachowicz. The roster also features Steve Maile, James Neil, Jason Buckman, Nick Compton, Connor Stokes, Lloyd Gibson, Glenn Billing, Owen Griffiths, Conor Pollard and Joe Graham along with netminders Adam Long and Jack Peacock. 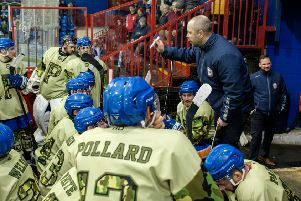 It will be coached by Nottingham equipment manager Adam Goodridge. The four-team testimonial includes Phantoms, Penguins and Pirates teams along with Panthers.